Sometimes life takes unexpected twists. One minute, for example, you might be busy writing (read as ‘staring out of the window, wondering whether putting the kettle on again constitutes thinking time’). The next, you may get an email inviting you to rehearsals for the most amazingly surreal light show that you’ve never had the remotest capacity to imagine. I am thrilled to say that my life is just like that. Rehearsals so far have been based on working out how, where and when the light reflects off the canals, bridges, buildings, glass walls and the other runners. From this, the performance will be designed by the choreographer, creative director and lighting designer to develop a unique – and, I have absolutely no doubt, incredible – event. The technology is pretty spiffy too. The suits themselves are cunningly designed with velcro strips so that they can fit anyone. The runners’ heights last week ranged from five foot nothing (me and two other shorties) to six foot four or more (one v lanky marathon runner). The LED lights that run down the sides of the suits and on the head pieces are controlled by wifi, so much of our rehearsal time was spent running in different spots to see how well the signal worked. As the lighting designer and his team experimented, there was a strange sense of unease when one of us suddenly turned yellow when everyone else was green. And if anyone’s lights went out completely it felt like a death in the family. We ran, we froze, we ran again. We did figure of eights and flower formations. We froze a bit more. We wove in complex loops on a bridge for so long we managed to get overheated. We changed colour all evening (both the lights and our faces – blue to red and back again). We ran some more, with our headlights on and our walkie talkies crackling – or maybe that was just mine! It was brilliant. 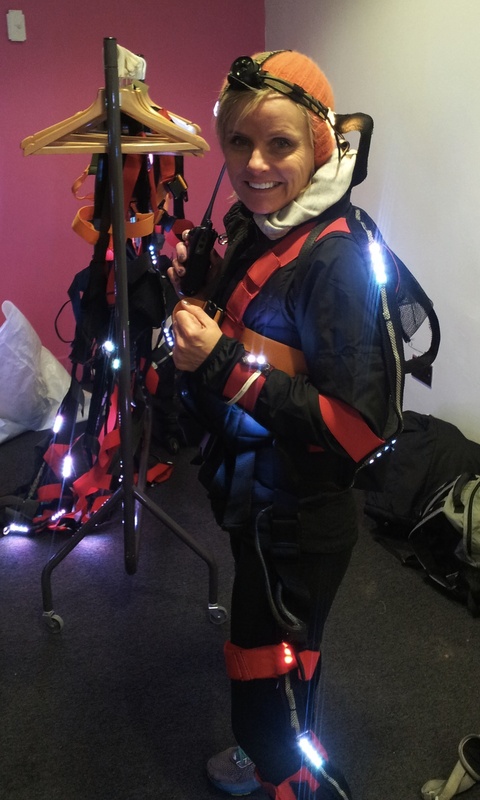 Light rehearsals – LED light running | Veggie Runners”.